The Next "MST3k" Box Set Is All About "Gamara"
In the midst of another rampage by Godzilla, Mothra emerges to save the human race from Battra. Army officer: Dr. Aoki, as a zoologist what would you say the beast is? Would you say it's a bird, or is it a reptile? Dr. Aoki: I would like to say there isn't any recorded history of it...let's just call it a monster. Gaos is my all-time favorite enemy of Gamera. A giant bat from a volcano who can fire lasers from his mouth, this wedge-headed critter can slice through anything but Gamera's carapace. Why do I like Gaos? He's virtually indestructible, mean and he looks great! 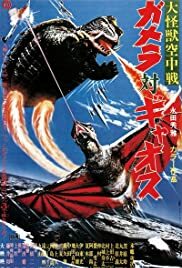 Gamera comes spiraling down to earth as a series of devastating volcanic eruptions are occurring. Out in the countryside, near a volcano, a road is being built through a farming village and the farmers are threatening a violent protest. out of the volcano flies Gaos - the biggest, nastiest, laser-firing bat you have ever seen. Almost immediately, Gaos chews up a newspaper reporter (who we didn't like anyway) and abducts a little boy. What is Gamera going to do? The cinematography and effects are a touch above average for the late 60s, and, as with the classic Destroy All Monsters, the subplots add nicely to the main story. Though this is one of my favorites in the Gamera series, it does drag a bit at times. Recommended for Kaiju fans. Also recommended for evenings of massive intoxication.